December 17, Russian State Duma’s defense and international affairs committees met to discuss the ratification of the US-Russian Strategic Offensive Reductions Treaty. As a result of the discussion a further procedure was agreed upon for the joint work of the executive and legislative powers on intensifying the ratification process. December 17, Russian Strategic Rocket Forces celebrated their professional holiday. We present a new section -- US Nuclear Forces C3 System (in Russian). Contents of the section were prepared by a well-known Russian expert Col. Valery Yarynich, Ret., Professor of Academy of Military Sciences. Welcome to take part in a discussion on expediency of a wider open coverage of Russian Nuclear Forces C3 system at the Russian START Bulletin Board. December 13 was one year since President Bush's official statement on US withdrawal from the 1972 ABM treaty: One Year Without ABM Treaty, - in Russian, (by Victor Litovkin, Pravda.ru, December 13, 2002). See also our special section: How Should Russia Respond to the Impending US NMD Deployment? Experts are divided on the new US National Strategy to Combat Weapons of Mass Destruction. Russian Ministry of Foreign Affairs expressed a hope, that the published National Strategy of the United States will contribute to further developing and deepening such bilateral and multilateral collaboration on the basis of international law and mutual consideration of national interests. 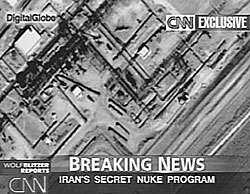 Media reports and Institute For Science and International Security brief revealed that Iran builds secret nuclear fuel cycle facilities. American official sources and IAEA confirmed published information. Tehran denies the accusation and invites IAEA inspectors to examine the facilities. Russian Minatom considers the new campaign as another US attempt to make Moscow stop construction of nuclear power plant in Bushehr. North Korea called on the International Atomic Energy Agency to remove monitoring equipment and seals from all North Korean nuclear facilities. Washington tries to resolve this particular nuclear crisis peacefully. See also our special section Treaty on Strategic Offensive Reductions. Status, Comments, Expert Opinions. In his interview for Indian media Russian president Vladimir Putin stressed that "...we take note of the statements made by President Musharraf that the military potential of his country is in safe hands, but, to be frank, the feeling of concern and anxiety still persists..."
Text of lecture on US and Russian Strategic Nuclear Forces: Nuclear Doctrines, Structure, Development Programs, by Dr. Eugene Miasnikov, Senior Research Associate with our Center, is now available on-line (in Russian). The lecture was given on November 15, 2002 at the Moscow Institute of Physics and Technology within Non-proliferation and Reduction of Weapons of Mass Destruction Regime and National Security course offered by our Center.